I am the middle of five children. I grew up in Forest Lake, Minnesota. My longtime girlfriend and kennel partner, Gwen Holdman, and I just got married April 29th. Member Kotzebue Dog Mushers, Ma-Mow-We-Tak, and ADMA. I race everything from sprints to long distance. I also give guided dogsled tours on a glacier in the summer. More or less my whole life. My parents had a few Malamutes that pulled me around the yard. I really loved dog mushing and it's just grown from there. My father let me drive the sled on a trip in the Boundary Waters and I smacked it into a tree and shattered the brushbow. I have handled for many different mushers but I would say my mentor was Arleigh Jorgensen. We are now up to 75 dogs. Pipe in the ground with a swivel arm attached. For cans we just screw a coffee can to their houses. Dry bedding and a long enough chain where they can run in a complete, full circle around their house for a little exercise. We feed Redpaw and supplement with beef or beef race mix in the winter. I like smaller dogs around 45 pounds with smooth gaits. They seem to hold up best and have a higher cruising speed, even though you may sacrifice some raw power. None, I deal with whatever quirks they may have. I have bought a lot of dogs with "attitude" problems and have always been able to work with them. I focus more on their physical talent. If they don't have the physical talent to do what you're asking them to do, then you don't have anything to work with. Izzy is probably my all-time favorite. She is quite a character. She would never quit even though she was a picky eater and sometimes got a bit run-down in races. At home she comes in the house and is a clepto-maniac. She steals things and hides them. She rarely chews things up but just likes to claim them for her own. She was my leader the year I won Yellowknife and pulled me through a pretty wicked storm in single lead my rookie year in Iditarod. It's a bit of a guessing game until you breed a line a few times and see what it tends to throw. Once you see consistent traits being thrown, then you have something to work with. You can then cross it to other lines to produce the type of dog you want. There's so much into making a good dog; build, gait, appetite, etc. It also depends on what type of racing I'm breeding the dog for. I try to breed for an all-around, versatile dog but I know sometimes if I do a certain breeding, the offspring will most likely be, say strictly sprint dogs or strictly distance dogs. Of anything though, I try to focus on physical talent more than anything. No, and I really caution against this because puppies grow at different rates and run according to what stage they're in. One month they look smooth and fast, then they hit a growth spurt and are all disproportionate and awkward. It's easy to judge puppies harshly but I don't think it's fair to make any firm decisions until they're over a year old. We just put them in a small team with calm adults and go very slowly and controlled. Sometimes they don't make until late in their two-year old year. We try to have dogs that can do it all. I know we will never be really competitive at the fastest of sprint races but we seem to be able to hang in there in longer--tough sprints like 25 miles and longer. We also are really starting to focus on Iditarod now. But we support ourselves through race winnings. We don't have any major sponsors. We try to hit as many races as possible, but we have learned that it's sometimes best to forego lesser important races in order to peak for the major ones. I try to always train for the first major race, which has been Wyoming or Oregon the last three years. We train the team for that and then adjust their speed/gait afterward according to which major race we hit next. Usually we take a group and slow them down for Iditarod and take the other group and speed them up for sprint races. Getting them physically prepared for what you're going to ask them to do in the race. Going into a race under-trained usually turns ugly. Four-wheeler and the track on our sled. We try and figure out where we can make the most money, both short-term in race winnings and long-term for kennel exposure. Having an eye for choosing the right dogs and preparing them physically and mentally for what they're about to endure in the race. Money, of course. Sometimes our team isn't always ideally trained for each race we enter because we switch around so much. Like I don't think we've ever really had an ideally-trained Iditarod team. We have to race hard in preliminary races just to raise the money to run Iditarod. We're usually patching together a mish-mash of dogs by the time Iditarod rolls around. There's not enough time after Wyoming to train the dogs perfectly for Iditarod, but Wyoming has been such a good money-maker for us the last few years. Another weakness of mine is that I may be too conservative at the start of races. I'm still not sure about this but I sometimes get beat by more aggressive starters. We would like to win the Iditarod but still be competitive at all styles of racing. We love to travel and race. A good, healthy working relationship with your dogs, physically talented dogs who are trained and conditioned properly for the type of event they're going to run, and experience. You learn best about racing by racing. I like the way it's growing. I don't want to see any style predominate the other because sprinters can learn from distance mushers and vice versa. It keeps our sport strong to have varied styles of racing. People say stage racing is the future, but I don't think anything will ever top Iditarod. Iditarod is such a hingepin for our sport. I hate to say it, but I deal with a lot of the public all summer long. 90% of the folks we give dog rides to have all heard about the Iditarod, but very few have ever heard of any other style of racing. Iditarod needs to stay strong and keep gaining exposure. It helps keep other styles of racing strong too. The children who follow Iditarod today in their classrooms will be the future CEO's who sponsor a local sprint or stage race in their town. It does work the other way too. The exposure the ATTA-Boy race and Wyoming have given to dog mushing in their areas have probably helped get more people to follow the Iditarod. But for now, Iditarod is the big one. I think it's important to be professional and a bit image-conscious. I know Gwen and I have lacked a bit in that category before, but if mushers, even the back-of-the-packers, look and act like professionals it gives our sport more credence and credibility. I don't have a great answer for this one. I haven't been as active in clubs and organizations as I probably should be. Get into it slowly. Try to handle for several different mushers doing different styles of mushing first. Once you figure out what type of dog you want to get into ,you should shell out the money and get good stock. It's a big investment that will pay dividends later. I think success in dog racing starts with having good dogs. That's your foundation. The first year I went to Yellowknife I was scared stiff. Lots of Alaskan drivers went over there and came back with their tails tucked between their legs. They had lots of horror stories to tell. I studied the race times and figured I had a team that could compete. It was a long drive, about 2000 miles. I was on spring break from college and had to drive straight there and straight back, by myself, to get back for school. We did the drive in two and a half days. The first day of the race I took it easy and was ninth. The next day I decided to try Izzy up in lead and we won. That was such a memorable experience, passing Richard Beck, then Raymond Beck and breaking into the lead on the second day. There were helicopters above filming the race and I felt like a champ. No one knew who I was. The last day I was second place and wound up fourth overall. 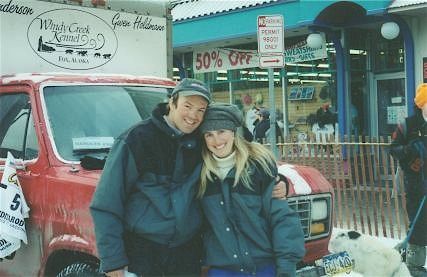 I made money on that trip and that's what started our lifestyle of traveling across the country to races every year.